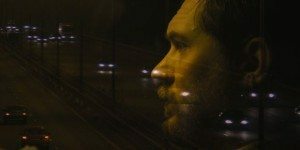 Here’s the thing about Steven Knight’s new film Locke: the entire thing takes place in real-time, in a car, traveling towards inky London. 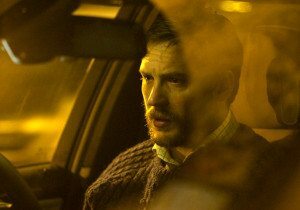 Tom Hardy plays Ivan Locke. His beard-shrouded face is the only one you’ll see — through the windscreen, in the rearview mirror, reflected in the light of passing halogen lamps. So it is a film daring in its conception, demanding of its star, and nimble in its construction. It also, you may be surprised to hear, works. Steven Knight, who wrote and directed this, his second feature (after the Jason Statham vehicle Redemption), is better known as a screenwriter. His Dirty Pretty Things and Eastern Promises were far from by-the-book lowest-common-denominator hackwork. It takes a certain sort of person to write an unstinting character study such as Locke. A person confident in his or her control. If you expect Locke to fill the gaps between Ivan’s near constant phone calling with swerving drivers, sudden traffic jams, or blown tires, guess again. This isn’t Speed or The Fast and the Furious. It is — from start to finish — just a man making and receiving phone calls while obeying the speed limit in a BMW on the M5. That man, as played by Tom Hardy, needs no other distractions. He’s saddled himself with enough. His Ivan Locke is a dependable, exacting construction foreman. Locke’s current project, a massive tower, is scheduled to receive its gargantuan, record-setting pour of concrete in the morning. His family — a wife (Ruth Wilson of Luther and The Lone Ranger) and two boys (Tom Holland & Bill Milner) — await him at home so they can watch the football match together. He will not arrive. He is driving to London to prove himself good, in a way that is almost certain to do the opposite. There has been a surprise development in Locke’s life. While revealing the specifics of this unexpected news may feel spoilery, Locke isn’t a film about unknown occurrences. It’s about tension, and you need to see what’s coming for tension to work. Ivan Locke had a one-night, intoxicated affair with a sad colleague (Olivia Colman of Hot Fuzz). This woman, Bethan, is, tonight, giving birth, two-months early, to Locke’s error of judgement. She is alone and unloved and he has decided to be there for her and his child, regardless of consequences. Of which there are plenty. Knight rides us alongside Ivan Locke as he drifts in and out of street light, through the buzzing reds and oranges of blinkers. His fancy car patches through call after call, with ringing that just won’t stop. It’s his boss Gareth (Ben Daniels) blowing his stack; his reluctant deputy Donal (Andrew Scott, Moriarty from Sherlock); his world insisting he do what’s right as he calmly claims he already is. That is all of Locke. Live with Ivan for 85 of the hardest minutes of his life. Tom Hardy is remarkable. Far more believable as a tortured construction foreman than as daft super villain Bane in The Dark Knight Rises. Is this performance more impressive than his physical, animalistic spin in Bronson? I don’t think so. Still, as the posters brag, Hardy’s work is uninterrupted excellence. 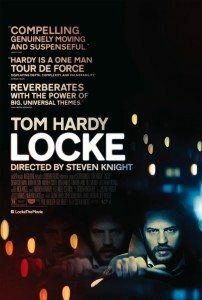 The character of Locke, as written by Knight, is also finely tuned. So often in films you know who you’re dealing with before a character gets their first line spoken. Ivan Locke is complicated, and confused. You become tangled in his vocalized thoughts. You try to understand him, to support him, to condemn him. All at once. The only misstep here is Ivan’s conversation with his dead pop, which lacks the veracity of the rest of the film. Too cinematic a device; too forced. More than that, it’s too clear. The exposition of what motivates Locke through this critical series of decisions isn’t endearing. Why does a man abandon one responsibility for another? For personal reasons. To know more is to deprive us of imagination. Locke looks and sounds exactly so. It is a film claustrophobic and fleeting. If you’ve pushed through, trapped in a car traveling fast, then you will recognize the impressionistic framing and editing as authentic to the experience. You might ask how it ends, or what Ivan Locke manages to redeem through his catastrophe, but that would be missing the point. The point is to know, for the length of the trip to London, a man. Ivan Locke. i kind of really want him to be doing the whole movie, but with his BANE voice.